Posted by beata-beatrixx at 8:47 PM 0 comments/comment? Watched Secret of Moonacre with my mother (one of those movie adaptations of a book I like that is nothing really like the book but I love it anyway). My cat is being obnoxious right now while playing with an old ribbon. Today was a lazy day again, but I finally feel a lot better. I think I'm going to embark on some spring cleaning tomorrow since I'm hoping to downsize now that only Jan-term and spring semester are left. Maybe I can show off my clean room once it's done? Posted by beata-beatrixx at 7:59 PM 0 comments/comment? The crests of Montague and Capulet, illustrative of the series' unique animation style. So I've been a little bedridden today and decided to go to Funimation's youtube channel to watch a new series that I'd been meaning to see, Gonzo's Romeo x Juliet the anime (Gonzo also did the animation for Kaleidostar if I'm correct.). It's based on Romeo and Juliet (obviously) but also has characters and plot elements from a large number of Shakespeare's works. The series opens in the floating world of Neo-Verona, where the corrupt Prince Montague has usurped the throne by slaughtering all but one of the Capulet dynasty (a two-year old Juliet). When Juliet turns sixteen, her identity is revealed to her and she must face the man who killed her entire family. Unfortunately--as it goes--Juliet is in love with Romeo, his son. The series has a great soundtrack and I actually liked the Japanese version of "You Raise Me Up" by Lena Mark that is used as the opening (the ending theme is a contrasting heavy rock ballad). I'm on episode eight now and absolutely hooked (OMG Tybalt! ), so I'm off to finish all 24 episodes here. Parting from this show is such sweet sorrow. Tata! Posted by beata-beatrixx at 3:37 PM 0 comments/comment? I used construction paper for the background (which I colored and decorated with colored pencils and markers), but ideally one might use old decorative wallpaper or scrapbook paper. I also mounted my silhouette (thicker black paper/cardstock) on pink construction paper to outline it. The little floral details are from stationary given to me by my best friend Glee, and the black and gold beads are from an old favorite bracelet. 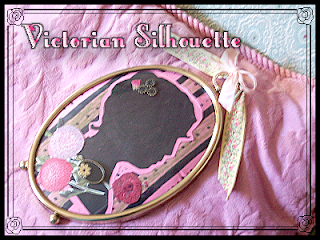 I like the idea of "mementos" so I put lots of sentimental objects like these into my silhouette. The oval frame and crowning ribbons are also my grandmother's. The process is easier if you use a digital camera to take your picture in profile. Directions can be found here. That's all for today for me--I'm going back to sleep now. Tata. Posted by beata-beatrixx at 3:01 PM 1 comments/comment? The new year is actually a pretty important day in Japan, so here's a little something Japanese I found to ring it in. The new year is upon us (on this calendar anyway), and so to follow up my awkward introduction post, I thought I'd some up some past resolutions of mine and reminisce on my subsequent success/failure at achieving them. Perhaps someone out there will be more successful. Plant a garden - This is officially graduated from "New Years Resolution" to "Before I Die." I still don't have a garden. I think it's because we moved around a lot and were mostly in apartments or rental places where you don't really get to have a private garden. On the bright side, it made me appreciate nature and flowers much more. You take silly sentimental stuff like that for granted until you're going crazy in industrial Florida where the only thing outside your door is an ugly palm tree and electric cables. Go to college - Yeah, I got one! But I'm a scholarly perfectionist, so maybe this was an easy out for a new years resolution for me. Write a novel - Another "I have friends who do this" one. I may study literature, but I'm not a writer (she says while blogging). I hate to say it, but I've never been creative enough to finish any creative writing pieces, mainly because it's too personal and I'm afraid of criticism. I mean, someone can critique my grammar or organization in a formal analytical paper, but to criticize my imagination--well, I'm a coward when it comes to that. So this resolution pretty much a gone-er (it's also been a "recurring resolution" if you get my meaning). Finish the whatsitcalled book series - This one was actually pretty fun for me. I finished the Chronicles of Narnia as young girl and all of the American Doll books this way, but I think a lot of serial literature or even various books with one author can be completed in this manner. It's probably the easiest resolution to stick to as well, and you can replace a book series with comics/manga or a tv/film series. I usually tack this one onto the end of a more problematic resolution ("This year, I'm going to do a full yoga routine every morning at 6:00!.....and I'm gonna watch the rest of the new Doctor Who!). Truth is, I'm not really that into the whole "new years resolution" thing. I think it should be like Monopoly where everybody gets $200 for passing "GO." Resolutions, however, I do like in general. And this year I happen to be resolved to blog. Posted by beata-beatrixx at 11:18 PM 0 comments/comment? Well,well, here it is--the new blog. One wouldn't know it, but I've put this off for a year. My new years resolution last year was to keep a daily blog, supposedly because it was en vogue. My new year's resolution this year (this past year) was to take up scrapbooking, due largely in part to the fact my more organized and successful friends all do it. Of course I'm starting 2010 scrapbookless, and my friends are all probably blogging about their fabulous scrapbooks as we speak. Go figure.So this time around, I've decided I'm going to finally commit to something for new years and start a blog to maintain the whole year through. I'll blog about my interests (fairytales, fashion,Wagnerian opera, metal, and art history amongst other bizarre and unrelated things), activities, hobbies, inspiration, whatever. It might be a picture, a song or even a story--but it will probably be something terribly anachronistic and romantic. I'm not a realist, and I don't particularly care to regurgitate and debate news stories and politics when I could talk about flowers. It's not that I don't care about politics (I'm actually very opinionated), it's just that life is so unpleasant as it is that all I want to do at this point is surround myself with pleasant things for a little while. Be an unrealist, one might say. I recently found an old diary from when I was a little girl and was amazed at how carefree and imaginative I was. Despite many childhood hardships, that little girl still dreamed about beautiful things and little magic worlds all her own. It may sound stupid and cliche, but I want to take a little piece of the me that dreamed back before I have to enter a world of graduate schools and business networking. Fly with Pan to Neverland as it were. Smoldering Rose is the forum for my wild escapism, and for anyone with similar interests who cares to share the experience. The process for the name was relatively simple: 1. Punch in majority of name ideas from my English-Art History double majoring mind into Blogger and realize most are unavailable, 2. Ask a friend. My friend suggesting "smoldering swan" after hearing I liked the element fire and swans as far as creatures, but since "smoldering swan" sounded a little too much like bad holiday dinner, I opted for "smoldering rose." Not a practical name, but then again, I'm not a practical person. I like it though, reminds me of the Sleeping Beauty fairytale and the valkyrie Brünnhilde since it hints at fire and thorns (and I'm kind of obsessed with all variants of her story). Plus, what could be more over-the-top and romantic than burning up some roses? Anywho, I like the name so it's sticking. See you all around, tata! Posted by beata-beatrixx at 11:17 PM 0 comments/comment?